A landmark ruling in California mandates that every new home has to be built with solar panels, which is expected to lower the cost of homeownership; a 2017 Year-End update features the size of each state’s solar market and the corresponding share of distributed solar which is represented by a pie chart; an Edison Electric Institute survey demonstrates Maryland residents support for the expansion of electric vehicle charging infrastructure; Michigan lawmakers will conduct a hearing, which will bring community solar for residents, nonprofit organizations, and other constituents; State regulators in Minnesota are introducing an incentive payment to address a new rate for community solar projects; Pittsburgh continues to be a leader of energy innovation with about 20 distributed energy and the implementation of nanogrid and microgrid projects; “Rush to Gas” may cost people billions; and a report on the US Power System. 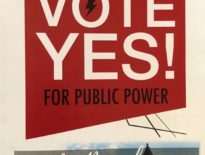 A majority of Maryland residents support the expansion of electric vehicle (EV) charging infrastructure in the state, according to an Edison Electric Institute (EEI) survey released on Monday that comes as the Maryland Public Service Commission prepares to hold hearings this week on the issue. According to the survey results, 76 percent of Maryland residents support advancing an EV charging network in the state, 61 percent believe an EV charging network would have a positive impact on Maryland’s economy, and 81 percent believe an EV charging network would have a beneficial impact on the environment. 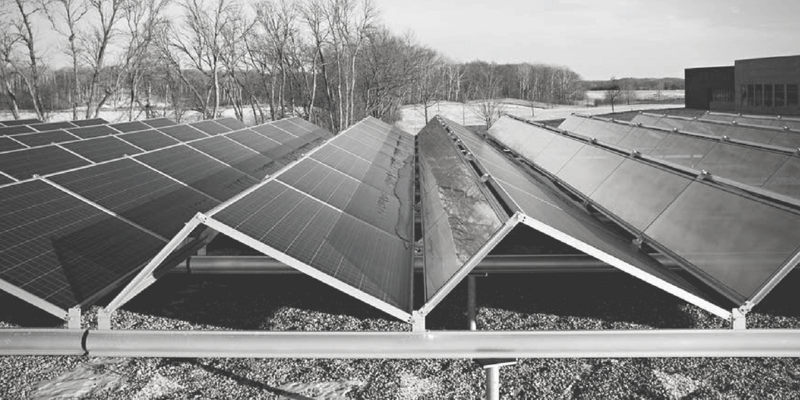 The Michigan House Energy Committee will conduct a hearing today on House Bill 5861, which will bring community solar for residents, nonprofit organizations and other constituents looking to lower utility bills and access clean energy options. The Community Renewable Energy Gardens bill is among five separate bills in the bipartisan Energy Freedom Package, which taken together would significantly advance Michigan’s clean energy economy. The original compensation method offered enough money to reach at least some residential customers, he said, but the value of solar approach provides a developer too little money to attract that market segment. Power producers are rushing to build natural gas plants and pipelines to replace retiring coal, but in less than 10 years much of that infrastructure will be more expensive to operate than the cost to build new renewables, according to an analysis released today by the Rocky Mountain Institute. That would leave investors and ratepayers saddled with billions in stranded assets. Minnesota they rose 48.2 percent to a total of 4,256, according to the Solar Jobs Census. That’s far more solar jobs than in any of our neighboring states, including Wisconsin, where they increased just 3.9 percent (to 2,921 jobs), Iowa (up 44.6 percent to 815 jobs), South Dakota (up 1.5 percent to 485 jobs) and North Dakota (down 16.7 percent to 145 jobs). Given these benefits, and the state support, the solar explosion in Minnesota is not surprising. But, as in any new market, there have been growing pains. Many installers complain that they can’t get enough labor for the demand. 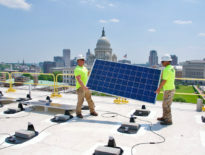 They cite a State Board of Electricity rule that solar construction is considered electrical work and must be staffed at a ratio of one licensed electrician to two unlicensed ones. With increasing demand on the number of Journeyman and Master (i.e “licensed”) electricians, they say this is effectively a bottleneck on growth and employment. The Duluth Transit Authority’s Jim Caywood spent last week in Greenville, S.C., where he was the first person locally to set eyes on the electric buses coming to Duluth this summer. The order of a half-dozen fully electric buses will roll out one at a time over the course of the summer. Almost 16 percent of energy sources used in Columbia in 2017 were renewable, a report presented to the City Council on Monday shows. This exceeded the city’s goal of having 5 percent of all energy come from renewable sources in 2017, and puts Columbia Water and Light on track to meet the goal of using 15 percent renewable energy by the end of 2018. These renewable energy goals were first approved by voters in 2004 and were updated by the council in 2014 to raise the standards. Columbia Water and Light has consistently beat the goals, according to the city. Three farms in Foster, Little Compton, and Smithfield will aim to decrease costs and upgrade business operations with a combined $54,000 in energy grants, the R.I. Department of Environmental Management announced Thursday. The projects, which are funded through the Rhode Island Farm Energy Program, seek to save both energy and money by encouraging farmers across the state to “green” their operations. That was certainly true when USU officials and executives from Rocky Mountain Power cut the ribbon for three new electric vehicle chargers at the USU Electric Vehicle and Roadway Research Facility & Test Track. The EVR facility houses another USU initiative, Sustainable Electrified Transportation Center, also known as SELECT, which brings industry and academia together to study electric vehicles. The project is expected to increase the use of electric cars throughout the region and is the result of a multi-state effort supported by Connecticut, Delaware, District of Columbia, Maine, Maryland, Massachusetts, New Hampshire, New Jersey, New York, Pennsylvania, Rhode Island, Vermont and Virginia. It also incorporates input from automobile manufacturers, utilities, EV charging companies and others. The multi-state effort was facilitated by the Northeast States for Coordinated Air Use Management (NESCAUM). The regional strategy offers a vision for electric vehicle charging infrastructure investment and provides a compilation of recommendations to ensure public and private funding decisions are strategically integrated. A much heralded report shows solar and wind will lower wholesale prices, but it also shows a coming evolution in the pricing profile of the grid. These shifts in timing, shape, regularity and length will drive energy storage demand. The US electricity system is at an extremely sensitive and uncertain juncture. More and more indicators point toward a future in which wind and solar power play a large role. But that future is not locked in. It still depends in large part on policies and economics that, while moving in the right direction, aren’t there yet. And so the people who manage US electricity markets and infrastructure, who must make decisions with 20-, 30-, even 50-year consequences, are stuck making high-stakes bets in a haze of uncertainty. According to a National Renewable Energy Laboratory (NREL) analysis titled, “National Plug-In Electric Vehicle Infrastructure Analysis,” cities in 2030 will need 4,900 Direct Current Fast Charging (DCFC) stations, while interstate corridors will only need 400 DCFC stations. Sidi Traore is the Communications Assistant for the Institute for Local Self-Reliance. He is a senior from American University majoring in Interdisciplinary Studies, which consists of Communications, Law, Economics, and Government with a minor in Accounting. Sidi aspires to be a lawyer in the future and hopes to practice in the areas of human rights, international, and/or immigration. Sidi truly cares about making an impact and substantial difference in individuals' lives, especially those who are vulnerable and do not have the access to the resources to ameliorate their legal needs.